Archontiko Mesohori is located in the old habitation of one of the most impressive picturesque villages of Greece. It is an old mansion of the 19th century, totally renovated in order to satisfy the needs of modern times. 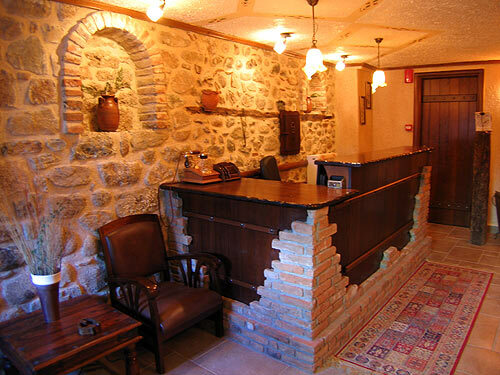 Located on Mesohori Square, in the shadow of the nearby Meteora rocks, this stone-constructed building offers comfort and strives to satisfy all your needs. Combining modern amenities with a traditional atmosphere, this renovated 19th century stone mansion offers rich, heavy furniture, wooden floors, iron or wooden king-size beds and inviting fireplaces. Consisted of 6 traditionally decorated, two-space Suites, it provides luxurious accommodation in a quiet scene. Each suite is named after an ancient Greek goddess: Athena, Afrodite, Ariadne, Artemis, Antigone, Anastasia. Enjoy the view of the rocks and the monasteries during the day, before gazing at a red sunset as you watch the light disappear behind the peak of the Pindos mountains. Discreet allure is in evidence throughout, with the public area and the small sitting area both ideal for relaxing evenings by the fire, with baked chestnuts, wine or 'tsipouro'. The garden is also available for a leisurely sit on warm summer day. A well-prepared breakfast is made with local ingredients is served every morning. Live the myth under the shadow of Meteora Rocks. Είστε ιδιοκτήτης ή διευθυντής στο ARCHONTIKO MESOHORI; Εγγραφείτε τώρα για δωρεάν εργαλεία, που μπορείτε να χρησιμοποιήσετε για να βελτιώσετε την καταχώρησή σας και να συνδέσετε την ιστοσελίδα σας και το σύστημα κρατήσεών σας.